Learn about the disk configuration to build a large HANA it can be configured into three types. This form is far When installing SAP ERP customers ( purchased companies) was a form to request a server (H / W) to those who purchase and install SAP on IBM, HP used to install the SAP ERP. This way , you can configure the server CPU 2 and 128G memory on one server in the form of one to install and configure the server to use the HANA primarily used as a development server to a minimum specifications. Respective CPU, memory are made up of four nodes configured as a 512GB. The HANA this form of cloud forms and can build HANA in a customer directly to AWS in the form used to configure the AWS (Amazon Web Services), you may also use the already established pay a monthly schedule amount to the company that services. Using Amazon ‘s AWS , or you can use a cloud service that provides SAP HANA Enterprise Cloud. When you configure the HANA H / W (HardWare) The one thing that classified by SAP, you can configure two types of HANA H / W in order to meet a variety of customer needs. These concepts have appeared repeatedly more difficult and hard to approach this idea.. I will describe the two types of the H / W Configuration In order to install the DB HANA. This is HANA offering the H / W to install a DB in the form just bring that is installed in order to install HANA DB The first HANA version already in H / W without customers direct installation that initially provided by SAP I did. Only when this is called Appliance lexical interpretation describes it easier to as ” appliances ” if you think you live we have a refrigerator in Hi-mart near the house , we just select the refrigerator of the desired capacity (180 liters) and give money scam If you are a home delivery , simply use electricity only plug-in. When SAP HANA Appliance and we also select the desired capacity (CPU, memory) and order simply be delivered to the company just put into use electricity. Take care not need to install it separately HANA DB without having to worry how should I configure disk (Disk) , simply just use geotyieoseo haenoteun installation and setup . This is referred to as a form of order and Appliance to use the right products. Pre- H / W (Hardware) on the CPU, Memory, HANA DB is already a form where you can use the Disk installed customer delivery (Delivery) products. It is possible to configure the H / W used in the form as desired according to the client’s budget configure the CPU, Memory, Disk as desired , the customer is the type used to install the HANA DB directly. Now I will explain to disk (Disk) configuration to install a full-scale HANA DB. Below is data showing how much they should set the Size of the Linux -specific file system. HANA DB is determined by how get going because they use the Disk -based memory. The general idea of HANA DB , you may want to think whether it is not necessary to disk (Disk) If the In-Memory DB. When I also store all the Data Memory Disk is the first time I do not think you need HANA DB you will also need Disk. The most fundamental reason is the memory (Memory) followed a volatile data (DATA) in memory when the power supply of the server to be installed in the middle of HANA DB will be blown away . That will not be all worked DATA When the power supply is interrupted. In order to prevent this HANA DB will also write the DATA in a memory to periodically Disk. So, HANA DB also will the disk (Disk) is required. The required disk capacity is taken up disk corresponding amount , depending on the size of the DB In-Memory. / : Linux (Suse, Red Hat) , disk space is being installed (Operating System) OS space are installed. Between about 10 ~ 50GB is sufficient space to install the OS . /hana/shared : HANA DB DB installation that space is being driven executable (Executable files), HANA DB Client, HANA Studio (Studio) , such as HANA DB associated with the necessary files to the directory is located . If the size is 128GB of RAM , you can set the capacity to 128GB. /hana/data : It is changed depending on the memory capacity HANA DB DATA directory space into a memory capacity 128GB here if you DATA size is also set to 128GB * 3 = 384 GB. /hana/log : HANA DB Log there is a change to the build-up directory , depending on the amount of memory space, memory capacity 128GB here if you Log Size is set to 128GB * 1 = 128GB. 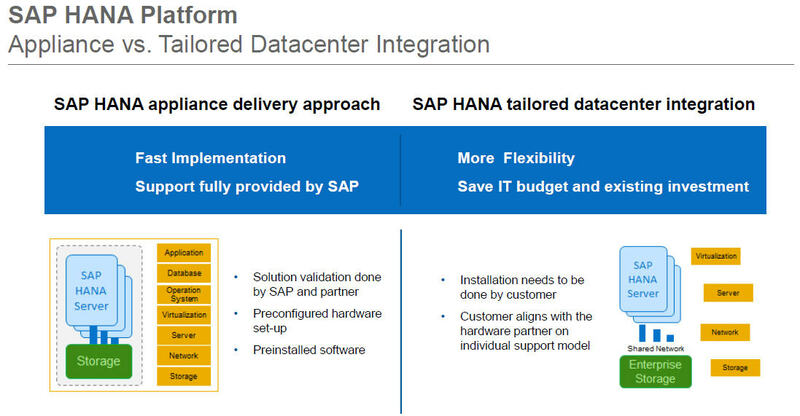 The following are some differences with the disk size HANA Appliance and TDI (Tailored Datacenter Integration). This is where the difference between SAP partners to deliver Appliance type of installation is as SAP, because it is calculated from the recommended disk (Disk) capacity that you want a low cost as possible because the customer to configure the desired H / W in accordance with the budget H / W the difference can be generated in construction. 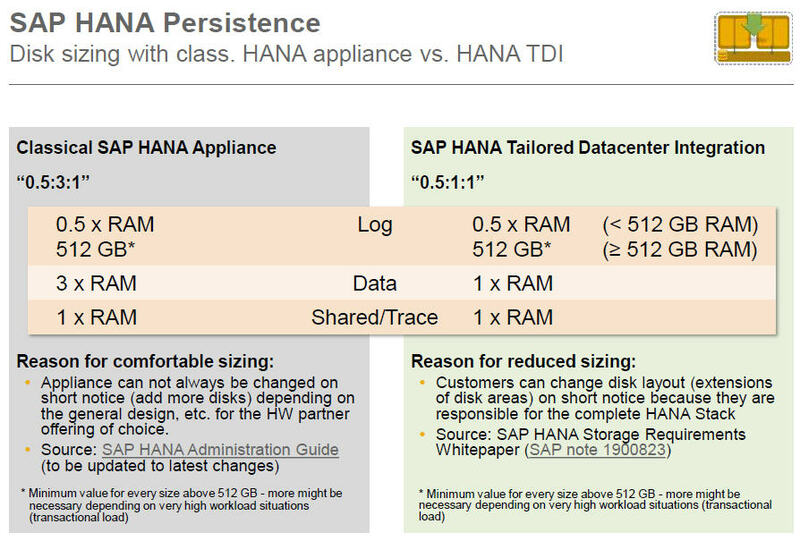 The big difference is the 3 * RAM inde him in half with TDI HANA Appliance DATA size can be configured to estimate a 1 * RAM. Here LOG size table LOG SIZE to some differences occur in the table above 1 * RAM is size and if you take up to 512GB the Log size if less than the amount of memory (RAM) under the 512GB tasked capacity much that SAP recommends If you have to go because less memory (RAM) size of the in-memory DB to calculate the Log size is 512GB 0.5 * RAM to go with only 256GB one it will largely be a problem this calculation. If the 512GB Setting the Log Size is no problem even if the memory capacity of more than 4TB. In this case it affects the performance of the HANA DB in accordance with the performance of the disk because the disk periodically flushed to the DATA from the memory on the disk are parts to be considered in using the disc . Thank you your notice about article.